As the night sky rotates, objects rise in the east and set in the west. They are highest in the sky when the cross the north-south line across the observer's sky. The diagram above is drawn for a latitude of 50°N, but similar logic applies at any other latitude. Click to expand. An object is said to culminate when it reaches its highest point in the sky. 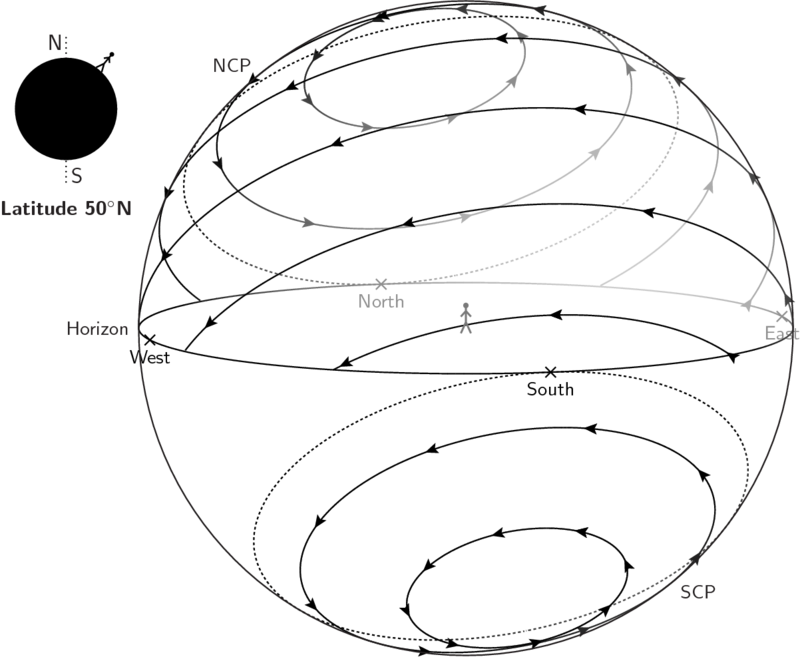 As the night sky rotates around the celestial poles (labelled NCP and SCP in the diagram to the right), objects rise above the eastern horizon, and set along the western horizon. They appear highest in the sky at the midpoint between setting and rising, when they cross the north-south line across the observer's sky. Specifically, this line is the great circle passing through the points due north and south on the observer's horizon, and through the zenith. This line is called the observer's meridian. Consequently, an object at culmination may equivalently be described as transiting the meridian, or often simply transiting. Atmospheric conditions typically improve significantly with distance from the horizon, and so the time of an object's culmination is often the optimal time to observe it, as well as the time when it is least likely to be obstructed.